Winter is harsh and can harm our dog’s paws. Whether it’s from the elements (ice, snow, dry air) or toxic chemicals (various ice-meleting salts), paws can dry, crack, get frostbite, and be harmed from chemical burns. Fortunately, there are things you can do to keep your pup’s paws protected in this frigid winter weather. Balms: Balms are great for preventing and restoring damaged paws. It provides protection against chemical salt, prevents ice/snow build-up, and soothes cracks and sores. 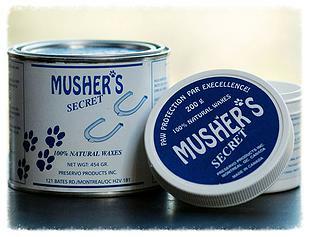 One of the most popular brands, and what we use, is Musher’s Secret. It works great, doesn’t stink, and it doesn’t leave a stain or residue. Before applying, there’s a little bit of prep work to do on the paw. First, trim the hair under and between the paw pads. This allows for balm to spread evenly and absorb onto the paw without getting caught up in the hair. The hair also gets snow caught up in between the paws, which can be uncomfortable and even painful to a dog. Little snowballs also form on the hair around the paws, so make sure no hair is dragging along the ground. 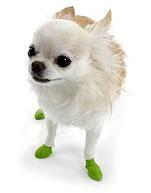 Then, right before you head out for the walk, rub a thin layer onto your dog’s paws. When you get back from the walk, if there’s any salt or ice residue/build-up, wipe your dog’s paws off. 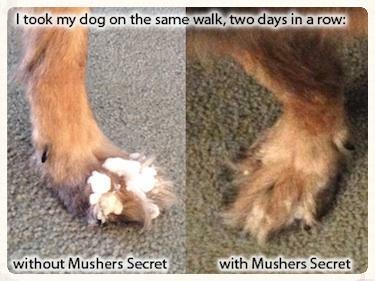 If your dog’s paws are looking irritated or a bit dry, go ahead and apply another layer to the paws. 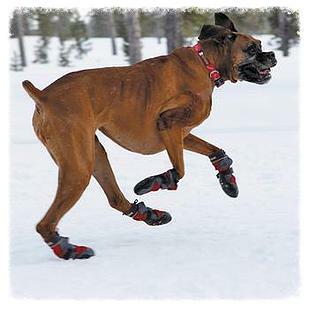 Dog Boots: There are a ton of different dog boots out there on the market. They can be short or long, thick or thin, with treaded bottoms, or even rubber ones you use only once. They can be great to protect your dog’s paws in all types of weather and terrain conditions, but finding the proper fit is important. We’ve experienced dogs getting sores from friction rubs because the fit is slightly off. If you want to explore this option, you’re better off taking your dog into a store to try them on – I wouldn’t buy online unless you’re positive they fit. Taking care of your dog’s paws in the winter is a relatively simple task, and it will make them a lot more comfortable and happy this winter.